Why 5X3.5 Oval Magnets Become a Natural Choice for Creating Sparkling Advertisements? Sparkling advertisements is the term, which may set you thinking, whether you should add the glitter of gold and other precious stones to the advertisements. No rather, you need to be more real, natural and at the same time sound convincing to create glittery sparkling advertisements. This blog explores the benefits of using 5X3.5 oval magnets for creating sparkling advertisements. However, before getting into the real topic, allow us to share some tips for illuminating advertisements. Many great English writers gave importance to undulated long sentences in their works and we all enjoyed reading them while at school and college. However, if you try to use the same trick to attract a consumer, it may not work. Your consumers are the people who are probably dying of hunger and yearning for a bite of pizza or those who are frantically searching for your contact details and they may not have time to stop and read long sentences. Avoid using passive voice in your advertisements because they are real turnoffs. People would appreciate your guts, if you say – “We only a call away at 855-762-4638 at your service 24/7” rather than saying “Our contact numbers are 855-762-4638”. Which sounds clinching? If you belong to the old school of thought, perhaps you would like to stick with the earlier sentence, whereas if you wish to adopt conversational writing stick to the last one. Try to make your campaign sound more conversational than business minded. Various research suggests that when you use a textual word such as smooth, silky, watery, or gritty, your brain activates areas of touch. Emotional words do have a similar effect on the minds. You can use emotional and sensual words, which trigger impulses from customers. For example – Some years ago, Cadbury Dairy Milk started offering its favorite milk chocolate under the name Dairy Milk Silk. Cadbury attempted to market the product by supporting it with advertisements that triggered the feeling of silky richness, when chocolate melted in the mouth. In reality, it was rebranding its existing formula at lower temperatures supported by the word Silk. Whatever be the reason, Dairy Milk Silk became the symbol of love and sophistication for people in love and all other chocolate lovers on earth. No wonder, it continues to be one of the Cadbury besties of all time. You should try to play around with emotional and sensual words while positioning your advertisements over 5x 3.5 oval magnets. Allow you to stay high on commitments and create lasting impressions with minimum efforts. 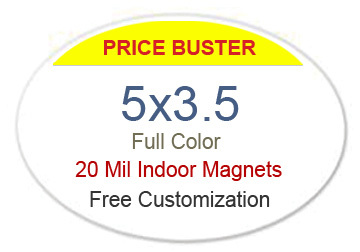 By sourcing your oval customized magnets 5×3.5 from any reputed online store, you can save on online design proof, art setup, shipping, and full color printing.